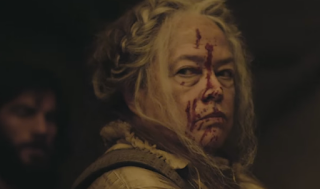 All speculation about who would play the real version of the Butcher on American Horror Story: Roanoke was put to rest during "Chapter Seven" when Kathy Bates' Agnes Mary Winstead finally met her idol. And unfortunately for fans who were hoping for her triumphant AHS return, Jessica Lange was not the Butcher. Yes, it would have been amazing if the original queen of American Horror Story had come back to the series to play Bates' counterpart — but alas, it was not meant to be. Yet, that shouldn't take away from the fact that the real Butcher ended up killing Agnes, officially putting an end to the actress' killing spree. After Agnes was not allowed back on the set of the reality TV show that made her famous (and deranged), she ended up killing Sidney and attempted to murder numerous other characters. Lee even shot her and the actress kept on going — trying to ensure her character's legacy. Well, when the dead finally did approach the Roanoke house during the blood moon, the actual Butcher was leading the pack. Although Agnes had been delusional the entire episode, upon seeing the colonist murderer she so admired, it appeared that Bates' character realized she was in trouble. Her paltry excuse of wanting to be on TV had zero affect on the Butcher (uh, duh — she's from the 1500s) and the Butcher split Agnes' head open with her trusty hatchet. But if you're one of the fans who was devastated that it wasn't Lange wielding the hatchet as the real Butcher, the fact that Bates' character is dead probably doesn't help matters. At least take some solace knowing that you aren't the only viewer sulking about Lange's non-appearance since fans on Twitter were also displeased. No Comment to " Jessica Lange Isn't Playing The Butcher On 'AHS: Roanoke,' But The Villain Still Made A Grand Entrance "